Luscious and cheesy, with crunchy coated eggplant, this Italian deep-dish classic is a bit of work, but well worth it, especially when The 99 Cent Chef shows you how to do it on the cheap! It's old school this time -- I fry the eggplant in oil, for an extra delectable crunchy breadcrumb crust, instead of the calorie-conscious baking method. But, I do substitute a lighter ricotta for typical mozzarella, and I use dried grated parmesan cheese instead of fresh shaved. It's cheaper this way and just as flavorful. 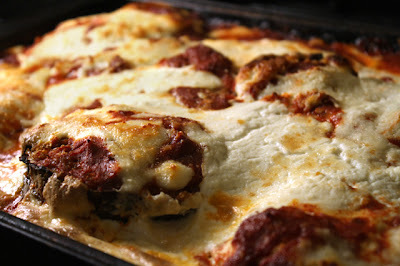 And yes, you can make an Eggplant Parmesan with 99.99 cent ingredients. I picked up everything, including: a large container of ricotta, dried parmesan cheese, tomato sauce, breadcrumbs, and a package of 2 medium sized eggplants -- each for 99.99 cents. Now if you don't have a 99c only Store, all these ingredients are less than you think - ricotta cheese is often cheaper than cheddar -- or substitute with budget cottage cheese. Jars and cans of tomato sauce are cheap anywhere; and a can of bread crumbs will last forever (after all, we are talking stale dried bread), so pick up a couple next time they are on sale. 32 oz. (2 lbs.) ricotta cheese - 1 large or 2 small containers. Allow to reach room temperature. Okay to substitute with cottage cheese. 3 oz. container of dried parmesan. You can use fresh grated. 1 small package of mozzarella cheese for topping - optional. I had a small 99 cent puck of Mexican Queso Fresco that I crumbled up and used. 1 large can or jar (about 28 oz.) of tomato sauce - your favorite. I used crushed tomatoes. 2 medium eggplants - I use medium slices so they will fit into a baking pan. 3/4 can of dried bread crumbs - about 4 oz. 1 1/2 cups of flour - for breading sliced eggplant. 2 tablespoons total of dried Italian herbs - oregano, basil, thyme and/or parsley. 1 cup of vegetable oil for frying - add more if needed, depending on size of pan. 1/4 cup of salt - for sweating eggplant. First slice eggplant into 1/2 inch thick round slices. Salt each side and place on a pan with a rack for draining off liquid. The eggplant should "sweat" for about an hour to take out any bitterness. (If you're pressed for time, this step is optional.) Next rinse off eggplants and pat dry with paper towels. Now time for frying. * Heat oil to medium/high (375 degrees). Oil should be about 1/2 inch deep in the frying pan. 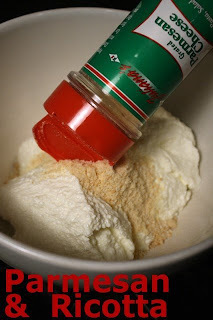 In one bowl whisk together 1/4 cup of milk and 3 eggs. On one plate spread out flour, and on another spread out bread crumbs. Mix dried herbs and pepper into flour and crumbs. First dredge each side of an eggplant slice in flour, then coat each side in egg wash. Finally coat both sides of wet eggplant slice in breadcrumbs. 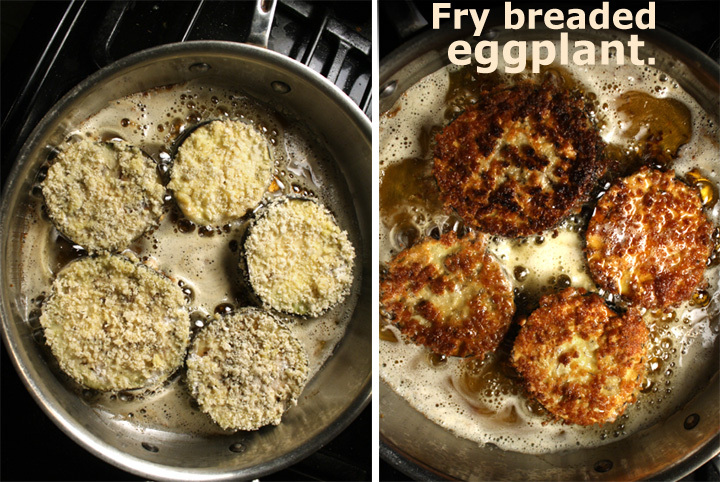 Repeat flour, egg, and breadcrumb steps for enough eggplant slices to fill the pan of hot oil. Add each coated slice carefully to the hot oil. 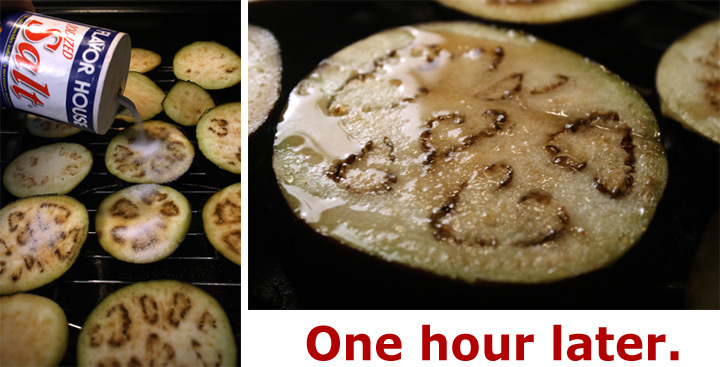 After 3 - 5 minutes (you should see bottom sides of eggplant browning), turn over each one to brown the other side. When the first batch is done, remove from pan and place on a rack or plate with paper towels to drain off excess oil. 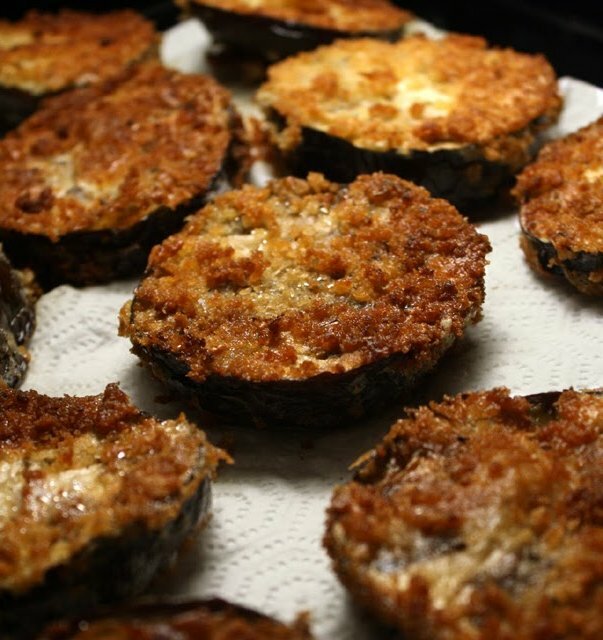 Don't handle fried eggplant too much, so the tasty crust stays intact. Repeat coating and frying eggplant rounds until they are all done and draining. Preheat oven to 375 degrees. Empty softened ricotta cheese (that is at room temperature) into a large bowl, and add dried grated parmesan cheese, mixing well. Into a large baking dish** (about 8 x 12 inches, and 2 inches deep) add a thin layer of tomato sauce, then half of the fried eggplant slices to cover the pan bottom. 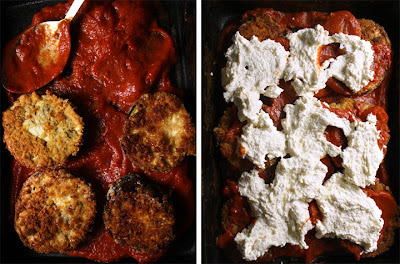 Next add half of the tomato sauce on eggplant slices and half of the ricotta/dried parmesan mix. For the next layer add the rest of the fried eggplant and top with most of the tomato sauce. Finally spread out the last of the ricotta and drizzle the rest of the tomato sauce on top. Now you can add a small package of shredded mozzarella or crumbled queso fresco cheese - optional. Tomato sauce in assembled dish should not come all the way to the top, or the melting cheese and liquid from the eggplant will be too much, thus overflowing as it all heats. Just to be safe you can place a cookie sheet or a layer of tin foil on a rack underneath. Now time to bake it. 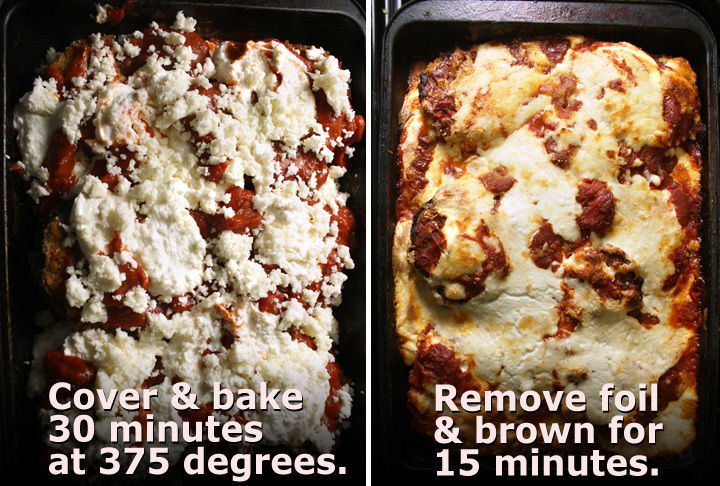 Cover Eggplant Parmesan in foil and bake at 375 degrees. After half an hour remove foil on pan and allow the cheesy top to brown for another 15 minutes. Allow to cool for a couple of minutes, then dig in! *And if you must substitute baking for frying: bake the coated eggplant slices about 15 - 20 minutes each side, in a 375 degree oven until browned. Then build the dish using directions above. **If you do not have a large, deep baking pan, it's okay to work with a couple of smaller ones, just make one layer of fried eggplant, tomato sauce, and ricotta cheese. 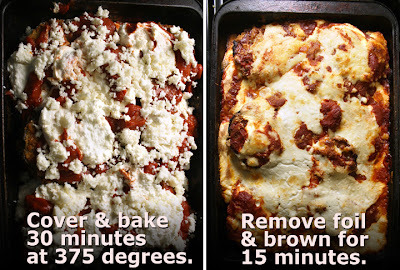 Reduce baking temperature to 350 degrees. I made this last week.. My daughter called me up the next day (it was too late the night before when I made it for anyone to eat any) after school and said she had tried some with the comment afterwards : "that was soooo good! Just like Lasagne!". Congrats on winning over a 13 year old to eat Eggplant!! 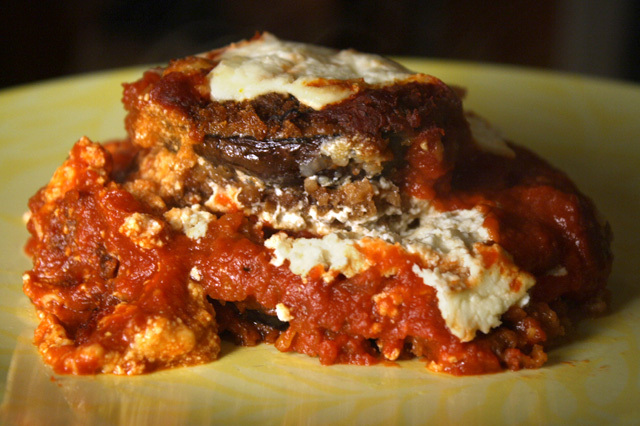 Hi Rick, glad your daughter now likes eggplant -- even if it's fried and covered in cheese! Nice tough with the Ricotta. Looks so good! But try this - peel raw eggplant, slice into 3/4 inch thick slabs. Salt and drain for 20 minutes, wipe off salt, brush on olive oil and grill! Everyone looooves them and when you make a garlic lemon tahini sauce it is fabulous. Baba gain oohs burgers with pita bread! Too easy!